Are you a lavender or legal herb farm wanting to make your own essential oils? Or a legal herb business wanting to make alternative medicines, concentrates, oils or tinctures with alcohol instead of using poisonous butane? ? If so, we have the herbal oil and steam distillation equipment you are looking for. We have what you need to make high quality oils, tinctures and concentrates. If you are interested in medium to large scale production of tinctures and/or concentrates & oils using alcohol instead of poisonous butane, contact us for more information about our jacketed electric stills. Alembics are a great choice for making essential oils and have been used to do so for centuries. With its large column for your botanicals, the flip top column alembic is a popular choice. Also popular are the soldered & riveted union alembics. We offer many styles in any size you need up to 1000 L.
This compact, modular still can be used to make many things, herbal oil and tinctures among them. 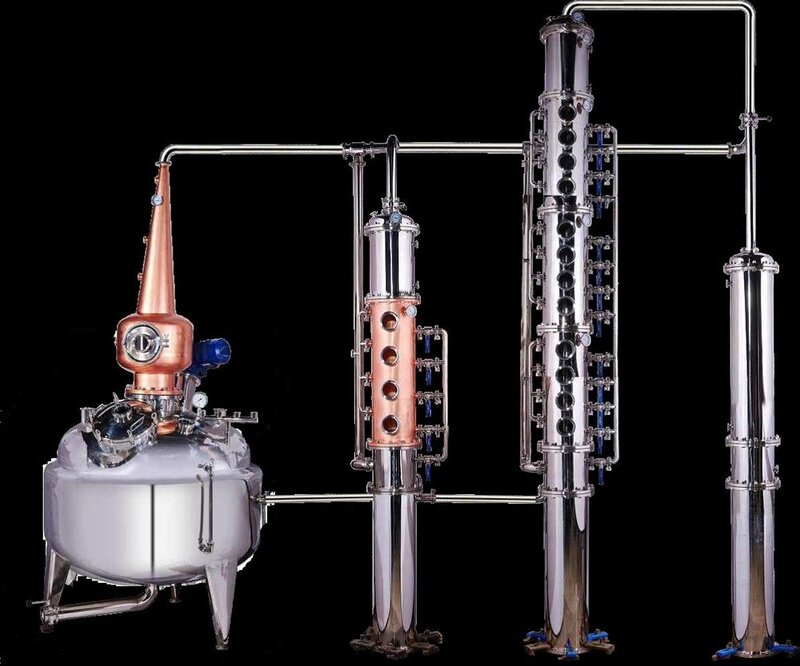 You can make your own alcohol cheaply with this still, and then use the alcohol to produce the finest, high quality natural concentrates & tinctures. No poisonous butane is necessary. Our stainless steel essential oil distillers comes with a pot still head, thermometer & garden hose connections for cooling the liebig condenser. Well built & beautiful to behold, these premium quality, multipurpose boiling kettles can be used for essential oil steam distillation, and many other uses. This still can be used for recovering your expensive neutral grain spirits after you have run it through your plant material when making concentrates or tinctures. We also have stills that can be used for making your own alcohol and for recovery.